The Thai government has announced it will waive tourist visa fees for three months as part of its attempt to boost the country's tourism industry. The visa fee waiving program is targeted mainly for Chinese tourists, who previously had to pay a small fee to enter Thailand. The global economic downturn, coupled with the political instability that led to the closure of Bangkok's two airports for over a week last December, will have a huge impact on the Thai economy, which relies heavily on money generated by the tourism sector. The government has allocated 1 billion baht of its 115-billion baht stimulus package to lure more tourists. The government is also considering lowering aircraft landing fees at the Bangkok International Airport to attract more foreign carriers to fly to Thailand. The Thai government has announced it will waive tourist visa fees for three months as part of its attempt to boost the country's tourism industry. The visa fee waiving program is targeted mainly for Chinese tourists, who previously had to pay a small fee to enter Thailand. The global economic downturn, coupled with the political instability which led to the closure of Bangkok's two airports for over a week last December, will have a huge impact on the Thai economy, which relies heavily on money generated by the tourism sector. 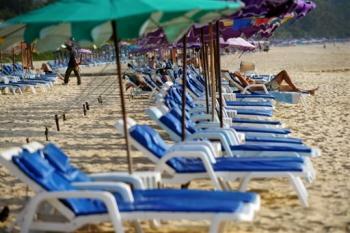 The government has allocated 1 billion baht of its 115-billion baht stimulus package to lure more tourists. The government is also considering lowering aircraft landing fees at the Bangkok International Airport to attract more foreign carriers to fly to Thailand.